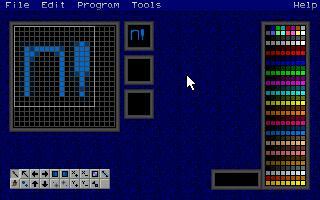 First Impression n!Media was first introduced when there weren't very many tile editors, and I can't get PP256 to run, so it was the best tile editor I've ever seen! What It's Like Your average tile editor. It's unfinished, but it's very good! A great palette, plus a couple neat features, with 1*1 from to 20*20 tiles. Just point and click. Simple. Fun. Neat. Other things you should know: This is far from being finished. It is a working demo. It's good enough to make all the tiles for your RPG, without the features. (You just have to draw them pixel*pixel. This is a neat program, though. Menu/Layout This has great graphics and a nice layout. It uses a good font, plus other neat, good features. It uses a Windows - like format. Usage Pretty simple. You point and click to do things. Type in file names, and that's it. It works great, and is easy to use! Flexibility/Features Ahhhh... n!Media's major downfall. It is not finished yet, so the lack of features will be fixed. Another thing I didn't like was that you can only save with a .mdt extension. Usability n!Media is very easy to incorporate into your program. The tiles are not regular BSAVE tiles, so it takes special code, which he supplies to you. There is also code to load the palette. Overall Impression Fine program. Very fine. It is easy to use, easy to incorporate, and is easy to use. It has bad flexibility and features, but the rest is perfect.